Those who are just planning your vacation, be sure to think about visiting one of the most interesting Scandinavian countries – Denmark, which is a great place to relax completely in all respects. Many museums and cultural monuments, monumental historical sites, ancient architecture, castles and palaces and, of course, the magnificent nature and the sea – no doubt in Denmark have all you need every traveler. Geographically, Denmark is one of the most southern among the Scandinavian countries, this small European country located on 409 islands. The capital of Denmark – Copenhagen is a city in which he lived and worked world-famous storyteller Hans Christian Andersen. The Danes consider themselves descendants of the brave Vikings, they were madly in love their country and with the warmth and hospitality greet her guests. 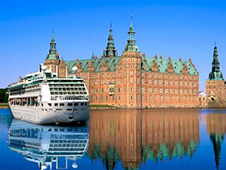 Getting to Denmark can be by plane or cruise ship at sea. All the other modes of transport locals prefer bicycles, which go for about 60 percent of the population. For those who prefer to travel in comfort, you should definitely think about renting a car through the service bookingcar.ru. What is required to get acquainted with the local traffic rules. at the entrance to the circular motion is necessary to pass the cars that are already moving through it. on high-speed roads from 110 to 130 kilometers per hour. It must be borne in mind that the Danish police strictly monitors all violations of speed limits. For these purposes, commonly used various radars and surveillance cameras. When the driver stopped by the police, you will have to pay a fine on the spot. And if surveillance cameras recorded the breach, the amount of the fine will be charged to the credit card of the driver of car rental company. For parking rental car on city streets Danish drivers need to worry about buying a "parking disc". It is sold at almost every gas station, banks, post offices, travel agencies, as well as some police stations. Putting the car with the drive can be for a period not exceeding three hours. You can park the car on the roadside, but no more than one hour and is strictly reserved for this time - on weekdays from 9.00 to 17.00, on the weekends - from 9.00 to 13.00. The disc is mounted on the side window of the car from the curb so that the arrow indicates the time when the rented car was parked. from 1000 € to several thousand euros for driving under the influence. In the event that the driver three times in three years, the police stopped for driving under the influence, he faces up to 10 years in prison and confiscation of the vehicle. In Denmark, it is strictly forbidden to drive a car or in a state of narcotic intoxication. The penalty for violation of this rule can be quite strict, by a fine of several thousand euros including imprisonment. To check the driver's police have the right to stop completely any machine at any time. At the disposal of the police, there are special devices that allow maximum accuracy, detect the presence of alcohol or drugs in the blood of the driver. In Denmark, there is no such thing as a toll road. The only thing that will have to pay - a journey on the Great Belt Bridge and the Øresund Bridge. The cost of the fare is calculated based on the weight of the car, its length and height, the average fee is 18 (for motorcycles) to 99 (for vans with the principle of euros). In that case, if the driver will pass through a payment station without paying, it will be imposed in the amount of 500 DKK.